COLUMBUS — A school district has re-tested its buildings for radon following questions from Call 6 Investigates about test results with high levels of the cancer-causing gas in several buildings. Radon is an odorless, tasteless carcinogen and is the number one cause of lung cancer among non-smokers. Call 6 Investigates analyzed data from the Indiana State Department of Health and found test results from 2013 that showed high levels of radon in Bartholomew Consolidated School Corporation classrooms. The EPA recommends schools take action to fix the problem when the radon levels hit 4.0 pCi/L or above. We brought those results to Superintendent Dr. Jim Roberts who, at a September school board meeting, vowed to look into what happened in 2013. 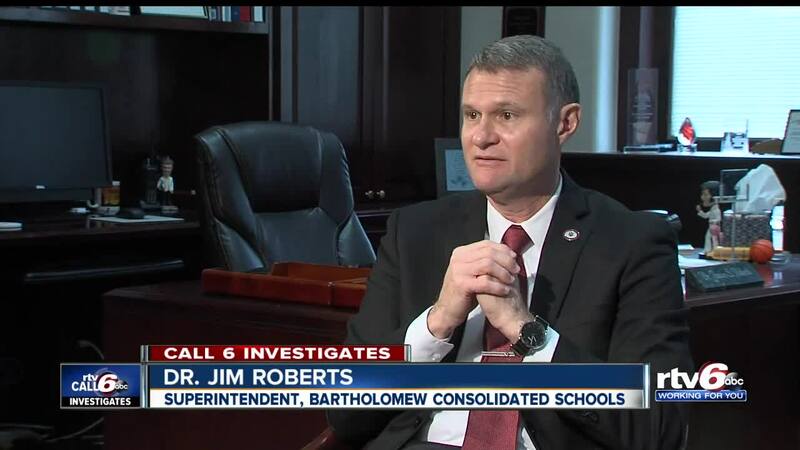 Roberts did not become superintendent in Bartholomew Consolidated schools until 2016. In October, Call 6 Investigates reported it was unclear whether the school district took action upon learning of the high radon test results. In his first sit-down interview, Roberts updated Call 6 Investigates Kara Kenney about the situation. “Radon is now on our radar,” Roberts said. Roberts explained in 2013, the district tested 21 buildings and 10 buildings came back with a reading of 4.0 pCi/L or higher. The testing company, Alliance Environmental, did the 2013 test during fall break. Radon experts told RTV6 that testing when students are out of the building is a no-no because the air handlers aren’t running normally and can give you false positives. “Testing should always be done under occupied conditions,” Kyle Hoylman, founder and managing partner of radon testing company Protect Environmental, said. Alliance Environmental has ignored repeated questions from Call 6 Investigates as to why they performed the district’s radon test over fall break when the buildings were unoccupied. Roberts said at the time, the school staff did not want to disrupt students with a radon test, and that’s likely why the test was done over fall break. Roberts said he believed the 2013 test did not accurately portray the actual radon levels at the time. CALL 6: You do not believe students or teachers were exposed to high levels of radon? ROBERTS: I do not, no. Based on the timing of the test in 2013, and how quickly the school corporation got after the various buildings. Helping with air flow, exhaust, and ventilation. I do not believe so. Between 2014 and 2018, Bartholomew Consolidated spent thousands of dollars to improve air quality, heating and air conditioning and ventilation at nine different buildings. Dr. Roberts said the decision to do so was not directly related to the radon test. "Those decisions were based on aging buildings who had a variety of concerns whether it was needing to add space, renovate space, or take care of the inner workings, the efficiency — those units like HVAC that need to be addressed," Roberts said. The district paid Alliance Environmental about $13,500 in 2013 for a radon test, records show. After Call 6 Investigates raised questions about radon, Bartholomew Consolidated schools paid Alliance Environmental an additional $8,500 to come back and re-test for the cancer-causing gas. The new test was performed while the students were in session, from October 16-18, 2018. This time, the results were much different. All student buildings tested below 4.0 pCi/L. CALL 6: When you got those results, what was your reaction? ROBERTS: It was relief. For the safety of our kids and our staff members, we are relieved we are looking at numbers under 4.0 pCi/L and we don’t want to spend extra money if we don’t have to. That money can be spent on student learning instead of spent on mitigating radon. Two buildings without students did show slightly elevated levels of radon — the Information Services Center and the BCSC Administration Building. CALL 6: You work in this building. Are you concerned at all? In the administration building, a storage area and lending library showed the higher radon results — not where workers spend much time. The district plans to re-test both buildings and come up with a plan for the future. Roberts said he’s communicated information about radon at public meetings and social media. CALL 6: Did you hear from parents? ROBERTS: We did not. I still think it’s something that not a lot of us are well educated about. Many of us have not even tested our own houses. Because of Call 6 Investigates’ reporting, state lawmakers filed legislation that would require schools to test for radon. Currently, Indiana schools are not required by law to test for the cancer-causing gas. Our investigation found 96 percent of school districts in Indiana haven’t tested for radon in the last decade, despite EPA recommendations to test at least once every five years. Bartholomew Consolidated schools plan to keep testing in the future, whether it’s required by law or not. Many school districts are looking into how to pay for radon testing. You can get home tests for free at the health department, but testing schools can cost thousands of dollars. Roberts said they’re looking at whether they can train and certify their own staff to do the testing. “There’s a litany of things we try to be concerned with, and this is now one of them,” Roberts said. “Radon is now on our radar. We view ourselves as the district of choice in Indiana and hopefully others will view us that way as well.